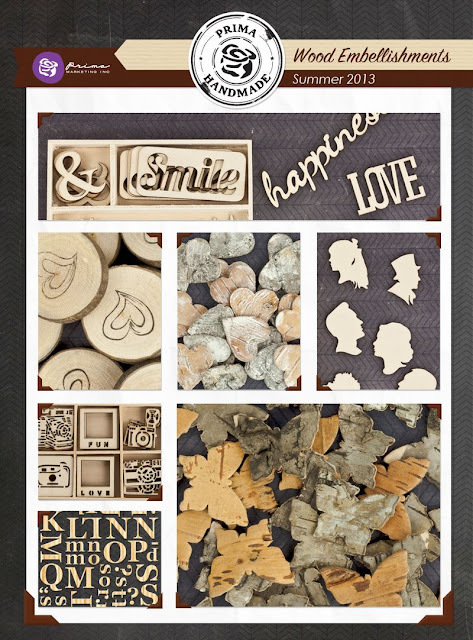 Prima has some interesting and innovative wood embellishments on the market featuring wood slices and actual bark shapes. Here is a piece I created using the new Prima Wood Embellishments and Bark Pieces. 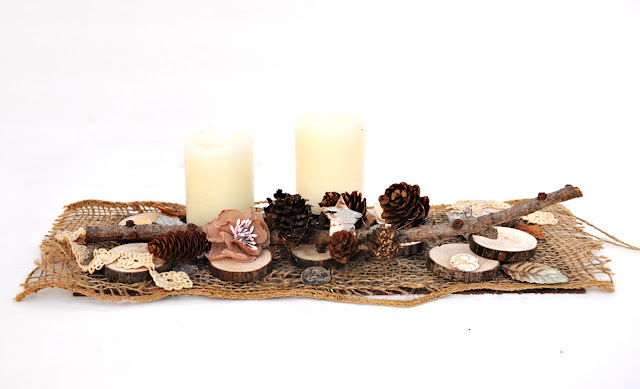 I am the daughter of a wood worker so I am captivated by the natural pieces. I wanted to continue a natural theme so I pulled out more textures and created a table centerpiece. 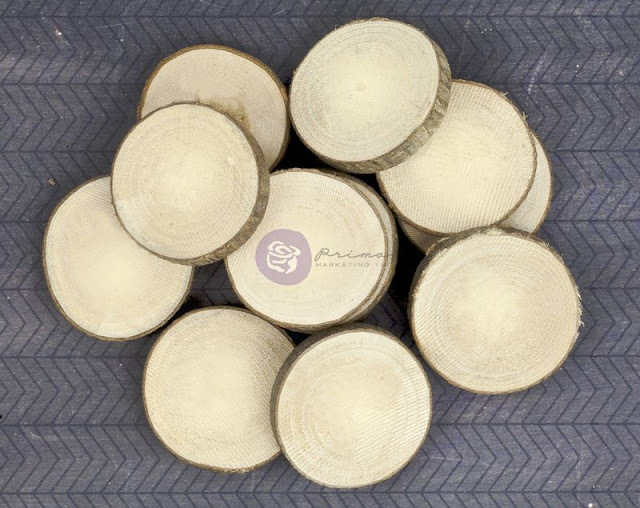 Here is an image of the wood slices. They are really clean and light which enables them to take color very well without colors being muddied and muted. This image is the actual size of each individual piece. whatever your mind can imagine. 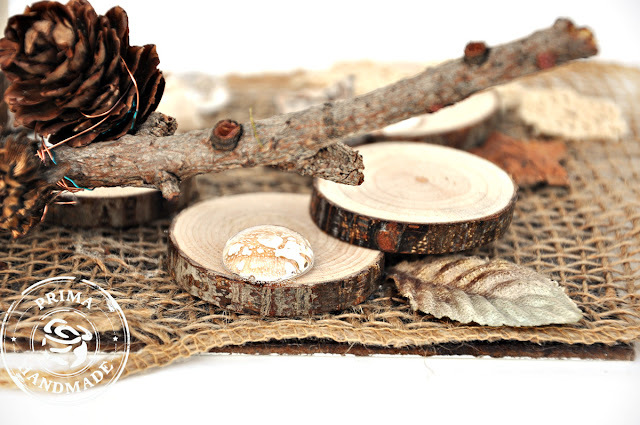 And here is a photo of some of the other bark and wood embellishments available. I cut a piece of plywood 12in x5in to use as a sturdy base, then covered the plywood with burlap. My candles are the new flameless kind - ok call them fake if you will, but they are really nice looking fake candles with real wax coatings. 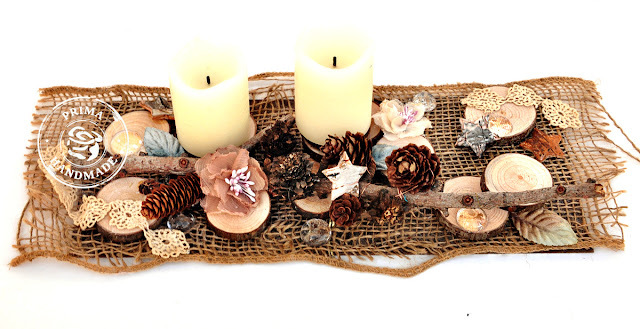 Point is, these are not going to ruin the project and your gorgeous new linen table cloth with melted wax drippings. This project is so easy and will take you about 15 min to assemble. Don't have plywood handy...hehehee...not that most people would. Then cut a piece of heavy duty cardboard and glue the burlap and Prima Wood Embellishments to the cardboard. This can also be changed for the seasons. Add some snowflakes or holly to it for a Christmas/winter theme, some bold red hearts for Valentines Day, some colorful Prima flowers for Spring and drop some orange and brown leaves on it for Fall. I also used some of the new Prima Pebbles on this piece as rain drops. This is the kind of decor I LOVE. So pretty and natural Jen! I saw this over at sb.com, and just had to check out your blog! 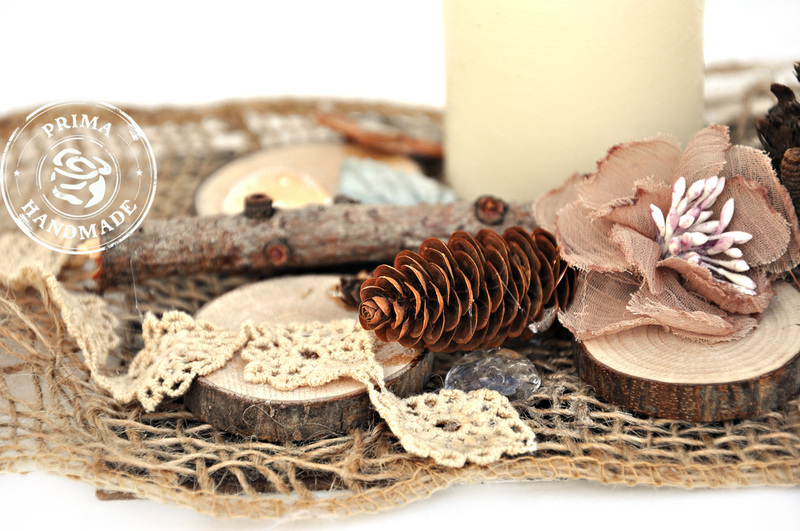 Thank you for showing us how you made your beautiful centerpiece! 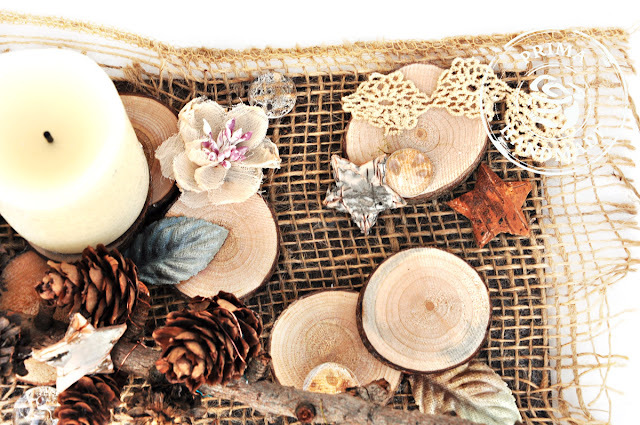 These wood embellishments from Prima are absolutely gorgeous, and you used them to perfection, Jennifer!